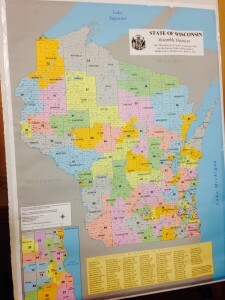 The state Department of Justice says Wisconsin should not have to draw new legislative district maps until after the U.S. Supreme Court has a chance to rule on a lawsuit challenging the boundaries. A panel of federal judges ruled 2-1 in November that Wisconsin’s 2011 legislative district maps are unconstitutional because Republicans drew them in a way that minimized the power of Democratic voters. The state is expected to appeal the ruling, but both sides in the case were ordered to submit plans for redrawing the maps to the court by Wednesday. The DOJ said in its filing that the case is likely to be decided by U.S. Supreme Court, so any changes to the maps should be on hold until the appeals process is complete. In its brief, the state argued that the court should order the Legislature to draw new maps after the case has been fully decided. Attorneys for Democratic voters who challenged the maps argue in their brief that the maps should be re-drawn right away, with or without the participation of majority Republicans at the Capitol, so that new maps will be in effect for the 2018 and 2020 election cycle. The state will draw new maps in 2021.